This episode of The Vampire Diaries is heartbreaking, to say the least. Old habits die hard and so does Damon’s love for Elena. Two epic love stories on The Vampire Diaries die tonight, while Damon’s (Ian Somerhalder) love for bourbon rages stronger than ever. One of the love stories we’re praying will return. The other we thought we could do without. OK, we can still do without it, but at least now we feel a little bad about it. So which one stays and which one goes? Keep reading to find out. Cat is out of the bag and quickly for Caroline (Candice Accola). She confesses to Katherine as Elena (Nina Dobrev) about her rendezvous with Klaus (Joseph Morgan). Katherine is only too happy to let Tyler overhear the entire conversation. Talk about squelching the boy’s dreams of reuniting with his former lover. Caroline realizes Tyler heard her confession and runs after him. He’s pretty disgusted with her and has some not so kind words to share. Just in time, it’s Stefan (Paul Wesley) to the rescue. He tells Tyler to back off until Tyler fills him in on Caroline’s side hobby in the woods. Stefan gets this conflicted look on his face. Then he punches Tyler in the jaw. Yes! Go Stefan! Of course, the reality check does settle in. Not that we’re big Tyler fans, but we are reminded that Klaus did in fact kill Tyler’s mother and loads of other people the town of Mystic Falls cares about. We can’t exactly hold it against Tyler for hating the guy. Now that these feelings of sympathy are creeping back in, we find ourselves questioning whether or not we could ever be happy seeing Tyler and Caroline reunite. It seems like we’ve got plenty of time to decide. Especially since, after tonight, the odds don’t look good that they’ll reunite any time soon. The second death of love is going to require a little more explanation. Katherine spends the episode in Elena’s body trying to make it her own permanently. In order to do that, she has to track down her body, which Damon has conveniently hidden away. Unluckily for everyone but Katherine and Nadia, Stefan unknowingly spill the beans by giving Katherine an essential clue only she would know. Though Elena fights for all she’s worth to keep her body, Katherine wins in the end. It really is a heartbreaking scene. Elena is running through the forest, trying to escape the spell as Katherine’s memories begin flooding her mind. Just as Elena reaches Damon and throws her arms around him, she becomes Katherine permanently. From there, Katherine takes great joy in putting Damon down and telling him that he and Elena are over for good. Of course, she doesn’t just leave it at that. She also tells Damon he’s bad for her, and he was right the first time to let her go. It’s so sad! So, so sad! But wait, Elena can’t be gone for good, right? Right? She can fix everything with Damon once she’s back in her body, right? The episode doesn’t clue us in to any hope for the future. We only discover that Katherine has a lot of hope for what’s next in the form of her “true love” Stefan. Gag! 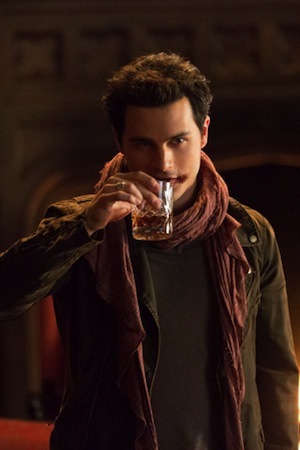 In the midst of Damon’s vulnerability, who should decide to stroll back into town but Enzo. And Enzo has big plans for Damon that start with a special present. Enzo wants Damon to finish off Aaron thus demolishing the Whitmore line for good. At first, Damon refuses, but after he thinks Elena breaks up with him because he’s no good, nothing is stopping Damon from being his really, really bad self. Enzo is more than happy to further Damon’s inner demon. In fact, we’re not really sure whether or not Damon has turned off his emotions. He seems to really not care about anything at the end of the episode. Especially not when he bites Aaron’s neck. And thus begins the Damon and Enzo bromance as Aaron bleeds out in the road. Not good.